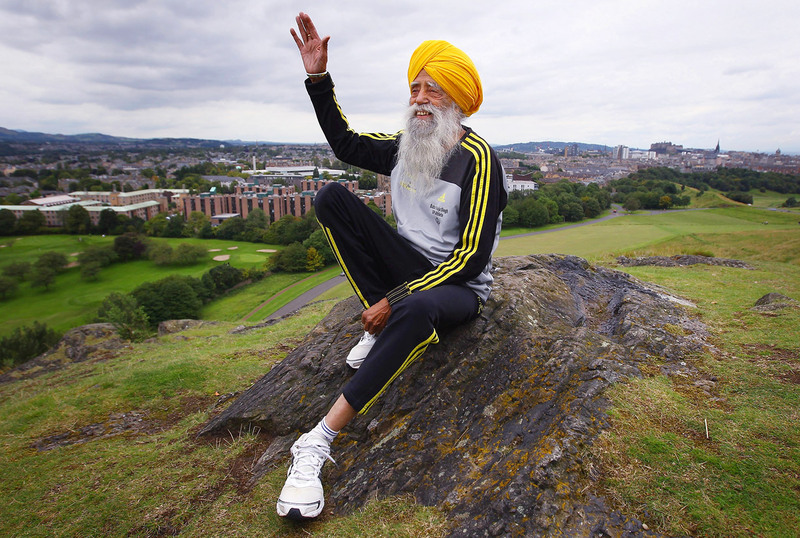 Fauja Singh ran his first marathon at age 89 and became an international sensation. Now 101 years old, he will run his final race on Sunday in Hong Kong -- and try to find peace with a Guinness World Records slight. THE PARTY WOULD BEGIN just as soon as the race ended. And the race would end just after Fauja Singh crossed the line in 3,851st place. By finishing then -- by finishing at all -- Fauja would do what no man before him had ever done. Amid the bundled and cheering crowd in Toronto, underneath a distended but gracious sky, he would complete a marathon. And he would do so at 100 years old. Was it pain he felt as he approached the end, just footsteps away from redefining the limits of human endurance? No, this wasn't pain. Fauja knew pain. Pain was death -- you see plenty of that when you live 100 years. Pain was bloody limbs and overtaxed joints -- you get too much of that when you insist on completing every race you ever start. This wasn't pain but exhaustion. And Fauja could handle exhaustion, because exhaustion foreshadowed euphoria. When Fauja got tired, it often meant a record would soon fall. Fauja Singh crosses the finish line in the Toronto Waterfront Marathon in Toronto on Oct. 16, 2011. He'd already broken a few. Fastest to run a marathon (male, over age 90), fastest to run 5,000 meters (male, over age 100), fastest to run 3,000 meters (male, over age 100), and on and on they went. But those records didn't roll off the tongue the way this one would. Oldest person to complete a marathon (male): Fauja Singh. The other feats had earned him recognition from the Masters Federation websites. This one would put him in the Guinness World Records. An official with the company had contacted Fauja's coach, Harmander Singh (no relation) several weeks earlier. Harmander told Fauja that Guinness would send representatives to watch Fauja run in the Toronto Waterfront Marathon, and as soon as he finished, they would award him the recognition he deserved. So Fauja ran in Toronto, arms swinging, yellow turban bobbing, chest-length Zeusian beard swaying in the wind. 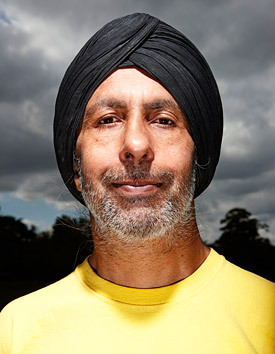 He was joined by other runners with roots in the Indian region of Punjab, their appearance in keeping with the traditions of their Sikh faith. Fauja trotted for the first three miles, until his coach encouraged him to slow to a jog. Speed was fleeting, the enemy of endurance. By mile 6, he'd downshifted to a toddle. After a break for a rubdown and some tea at mile 18, he settled into a walk. The exhaustion took hold sometime around mile 20, but Harmander kept Fauja upbeat with white lies about the remaining distance. He'd tell Fauja there were four miles left when there were actually six, then two miles left when there were actually three, making Fauja believe he'd covered more ground than he actually had, until finally Fauja saw the only mile-marker he understood: the finish line. What had been silence between footsteps was now music and cheers. The slog to the finish reminded Fauja of his wedding day, of the joy that awaited at the end of the long aisle. He waved to the crowd as he walked across the line, then lifted his arms and accepted a medal. He'd finished in 8 hours, 25 minutes. There were smiles and handshakes and photos with friends and strangers, then a rambling news conference for Fauja to reflect on his record. Amid the chaos and congratulations, however, Fauja and Harmander never noticed the absence of one celebrant they'd expected. They didn't realize that Guinness was nowhere to be found. Harmander Singh runs with Fauja in Valentines Park in Redbridge, London. THE VILLAGE OF BEAS PIND sits in northwestern India, not too far from the Pakistani border, right along the Jalandhar Pathankhot road. It is quiet and nondescript, a place for farmers and their families, their daily routines dictated by the whims of the weather and the yield of the land. On one spring morning in Beas Pind, Bhago Kaur gave birth to a son. The women of the family decided to call him Fauja, meaning "army general," or "soldier." The year was 1911. At least, that is, if you believe Fauja Singh. The man has no birth certificate, because at that time, in that part of the world, there were no birth certificates. The British ruled India until 1947 and, according to Michelle Ercanbrack of Ancestry.com, the country did not begin registering births until 1964. 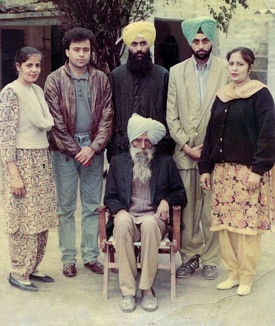 There is no record when this family photo was taken, but it is at Fauja's ancestral home in Punjab, India. But none of that would matter for another century or so. In 1911, it mattered only that the boy was healthy and happy and loved. By his second birthday, however, Fauja's parents had cause for concern: He couldn't walk. The way Fauja tells it, his legs were short and spindly, capable of movement but too weak to support his body. He turned 3. No steps yet. Then 4. Still crawling. Children called him danda, Punjabi for "stick." Family members worried he might be crippled for life, so they consulted village doctors. Generally unfamiliar with Western medicine, the local health care providers were likely to concoct an herbal remedy for illness or prescribe human urine for injuries, but in Fauja's case, they saw nothing wrong. The boy was just weak, they said. Nothing could be done. Finally, at age 5, he developed enough strength to hobble. Proper walking didn't come until around age 10. In the Punjab, schools were scarce and attended only by the upper classes, so as he grew, Fauja joined the village's other men on the farm. He fed the cattle. He worked the land, growing maize and wheat. When monsoon season brought rain and rain turned dirt to mud, Fauja returned home each day with his clothes soiled, ready to rest with a hot cup of tea. He subsisted on milk and yogurt and conversations that stretched from afternoon to night. It was a simple life, each day's monotonous pleasures carrying over to the next. Years passed. Fauja married. His wife, Gian Kaur, had three boys and three girls. Years more passed. The children grew. By the 1960s, most had married and moved, one by one, to the West. One settled in Canada, the others in England. One stayed at home -- Kuldip, Fauja's fifth child and second son. In 1992, his wife died. Fauja grieved but felt thankful, celebrating a long life well lived. He was 81 now, surely approaching death himself, and he was happy to live out his remaining days at home with Kuldip. "I have always loved my children the same," he says, but there in the village, he could see and touch and smell only Kuldip every day. In the mornings, they worked the fields. In the afternoons, they laughed over tea. In the evenings, they retired to their roadside home. There was no favoritism, he'd say, only the intimacy of a life shared. In Punjab, the monsoons came each July. Hot air rose. Air pressure dropped. Rain fell and crops grew and farmers celebrated their windfall while seeking shelter from the spewing and malevolent sky. One night in 1994, Kuldip and Fauja walked outside to make some repairs to an irrigation channel that ran next to the site of their newest business venture, a roadside restaurant. Wind and rain whipped across the village, ripping a sheet of corrugated metal off the roof of the restaurant. This was typical in Punjab, where the violence of the weather patterns often overpowered the infrastructure of the villages. Everything that would come later in life -- the records, the travel, the fame -- all of it was in response to that night. But when Fauja is asked to recount it, he lets his translator tell most of the story. He'd rather not say that he watched the sheet of metal fly at his son's skull, watched iron collide with flesh and his son's head fly off his body. He'd rather not remember the rain falling as Fauja screamed, looking on as his son lay on the ground, dead. Decapitated. He will, however, mention the thoughts the came next. Fauja Singh at the Gurdwara Singh Sabha Seven Kings, a Sikh Temple, in London. THE MONOTONOUS DAYS, once so benign, now trudged forward underneath the weight of loss. Fauja sat in his home or under the nearby trees, stone faced, waiting for each day to end. He picked fights. He lost friends. He wandered around the village, alone and aimless. He walked to the spot where his son's head had once rolled, and he stared and mumbled and cried. The villagers worried. They called Fauja's other children in London and told them, Your father's gone crazy. The children decided Fauja needed to be near them, so they asked him to move to England. He boarded a plane, leaving most of his possessions behind. He'd visited London over the years and found it "fantastic and different." But this time: "I was going only to forget." At first, the new setting was no better. Too old to work and illiterate besides, Fauja felt no purpose or responsibility. "My mind," he says, "was still in India." Yet his depression had come to London. 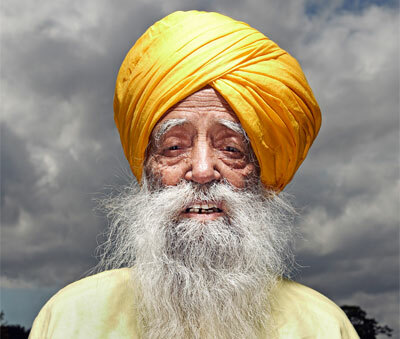 At 101, Fauja Singh is believed to be the world's oldest marathon runner. Looking to get out of the house, Fauja began running with fellow Punjabi expats at Sikh community gatherings. "I needed something to distract myself," he says. Nearly 85 years after Fauja had been too weak to walk, he found himself in decent physical shape. While his new expat friends had spent much of their lives enjoying London's conveniences, Fauja had spent his days laboring on the farm. He challenged fellow seniors to sprints. He won. When there was no one available to race, Fauja set off running by himself, and he built up his distance over time. When running, Fauja realized he thought only of his next step. After enough steps, his mind went blank, and with his feet pounding the pavement, Fauja says, "I felt connected to God." The anger evaporated. For at least a few moments, Fauja escaped his grief. Fauja lived with his son, Sukhjinder, and his children took care of his expenses. He still collected a pension from the government, however (as do many of the UK's elderly residents), so he allowed himself to indulge in expensive clothing. 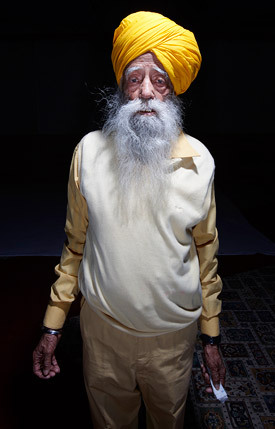 After a lifetime in functional Punjabi garb, he took quickly to London's high-fashion aesthete. He couldn't speak the language or follow the customs, and his beard and his turban marked him clearly as a foreigner, but from the neck down, Fauja looked the part of a Londoner. He had another indulgence, too: television. Fauja hadn't owned one in India, so now he passed hours flipping channels on the couch, and one afternoon, he saw a mass of people crowded together on the road, running along in T-shirts and shorts. Curious, Fauja asked around, What were they doing? Soon he found out it was an organized race. A marathon, they called it. Fauja decided that if the people on TV could run a marathon, then surely he could run one, too. 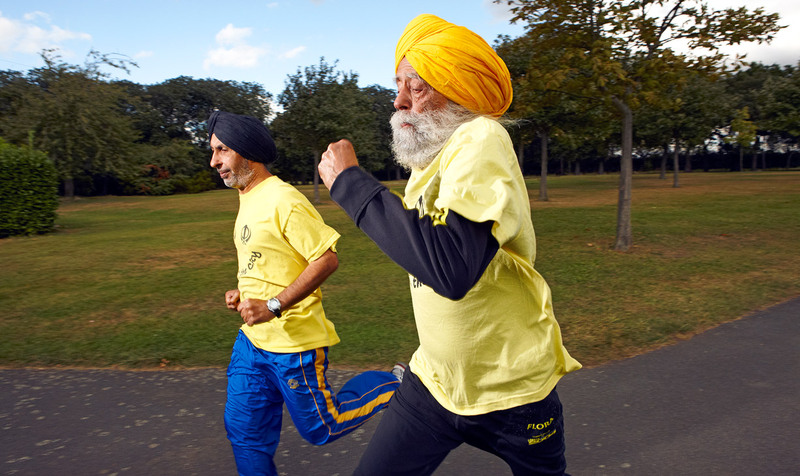 Fauja Singh ran his first marathon at age 89. THROUGH A MUTUAL ACQUAINTANCE, Fauja met Harmander Singh, an amateur marathoner who trained others in his spare time. Fauja told Harmander he wanted to run the London Marathon and needed a coach. It was February of 2000. The race was in April. Fauja had 10 weeks. On the first day of training, Fauja arrived limber and energetic and dressed, as he believed was perfectly appropriate, in a dazzling three-piece suit. Harmander told him he needed a wardrobe change. After adamant protests, Fauja relented, ditched the suit and bought running gear. He showed up every day after that, building his routine around his training schedule. His mileage increased as the weeks passed. Race day arrived. After 6 hours and 54 minutes, 4:48 behind winner Antonio Pinto, Fauja crossed the finish line. At age 89, he was a marathoner. Soon, he would be a star. FAUJA ENTERED THE LONDON MARATHON again the next year, 2001, this time with a record at stake. He needed to beat 7:52 to be the fastest marathoner alive over age 90. He broke it by 57 minutes. Now came the interviews, the photo ops and the requests for public appearances. Fauja became a staple at events held by the Punjabi diaspora, showing up to weddings and parties and school festivals, giving hugs and shaking hands. 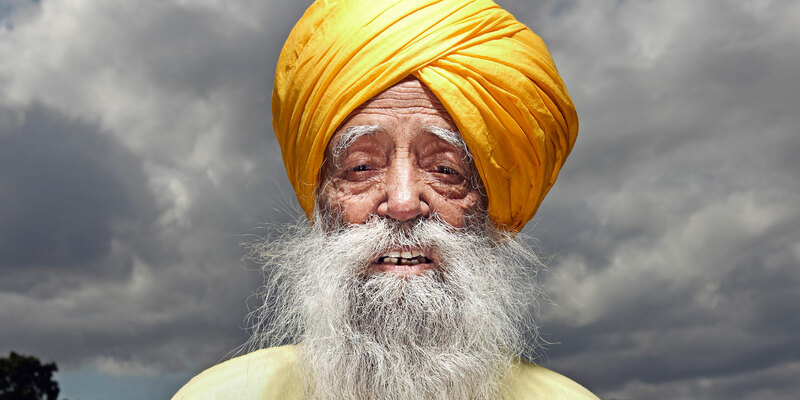 Fauja kept running, and his time kept dropping, and in 2004 adidas called, eager to include a turbaned nonagenarian marathoner in its "Impossible is Nothing" ad campaign. Fauja was featured alongside David Beckham, and his image was used in magazine ads, along with the tagline: 6:54 at age 89. 5:40 at age 92. The Kenyans better watch out for him when he hits 100. 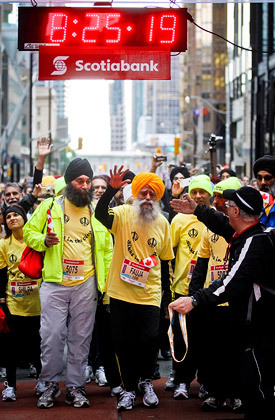 "I felt connected to God," Fauja Singh says of his running. According to Harmander, Fauja gave all the money he received to charity. Many races paid for his travel expenses, but at home, he could live off his children and his pension. He raced in Scotland and Canada and all over England. "I had a new focus," he says. The more he ran and gave, the more he pushed back his grief. As he traveled, Fauja barely knew where he was from one day to the next. If you asked him about "adidas," he'd have no clue who you were talking about. He knew it only as the company that sponsored him, who brought him in for photo-shoots and events. The attention -- that's what Fauja loved. He may have donated the money, but the smiles and handshakes from friends and strangers alike, the hugs from blondes and the questions from reporters -- all of that was for Fauja and Fauja alone. He almost never turned down requests for appearances or photos, always eager to step into any room whose attention he could command. So when Fauja came to the United States for the New York City Marathon in 2003, he wanted all eyes on him. Specifically, on his head. Post-9/11 America had become a difficult place for turban wearers. It mattered little that turbans were most common among Sikhs, and that Sikhs -- whose monotheistic faith originated in India in the 15th century -- played no role in the attacks on the twin towers. Sikhs wore turbans. And in 2003, turbans were bad. Dozens of hate crimes against Sikhs had been reported across the country. In Phoenix, a Sikh truck driver was shot twice by men in a pickup truck, unprovoked. In Maryland, a Sikh family received threatening letters and had its home vandalized. In New York, a Sikh police officer resigned after his supervisors ordered him to shave his beard and remove his turban. For Sikhs, the turban is worn as a marker of never-ending accountability. 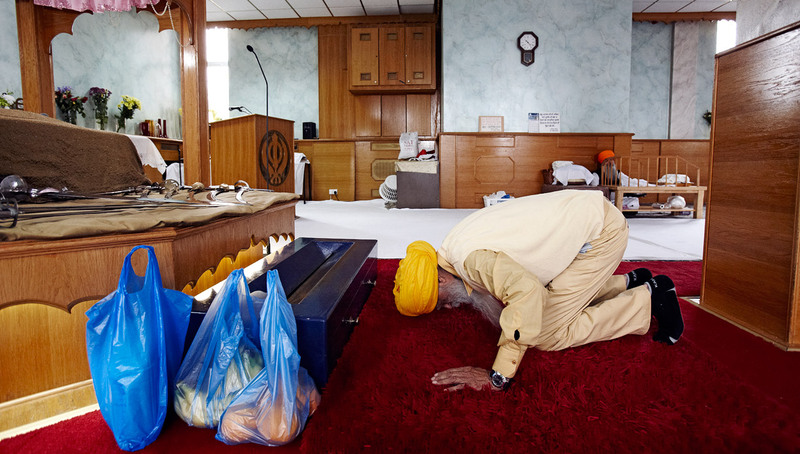 Everywhere he goes, a Sikh man is marked by his religion. This is by design. It's a constant reminder -- a man doesn't represent only himself; he represents all who share his beliefs. So Fauja arrived in New York, dying to spark conversation over his turban and his faith. If he could run a good race, perhaps even break a record or two, that would help. By this point, however, Fauja was on his third marathon in less than seven months. The miles had taken a toll. He showed up for the race with the flu, jet lag and a bum ankle. Once he got going, he had to listen to cries of "Osama!" and "Saddam!" from the crowd. The pack pulled away, and Fauja slipped behind, stopping every so often for rest and medical treatment. Blisters formed, and soon they burst, the blood filling Fauja's sock. His run became a walk; his walk became a hobble. With his foot throbbing, Fauja shouted in Punjabi to whoever could hear, "Just chop it off!" Paramedics trailed close behind, but whenever they asked whether he needed help, Fauja just waved them away. He would finish, and would show Americans what kind of men wore turbans atop their heads. After 7 hours and 34 minutes, more than half an hour slower than his previous slowest time, Fauja crossed the finish line. After he finished answering questions from reporters, he collapsed. Within moments, he was surrounded by paramedics and lifted into an ambulance. Cameras clicked, capturing the old man, frail and slow, with a turban wrapped tight around his head, looking closer to death than to ever finishing another marathon. He felt certain he'd failed to convince anyone of a Sikh man's strength and kindness. Never mind that cheers had far outweighed slurs, or that the next morning's papers would make only passing reference to his injuries. In Fauja's mind, he'd become a symbol of weakness, deserving of pity, not respect. He made a vow: He'd never run again. Harmander Singh would not let his student quit. ONE PROBLEM: Harmander wouldn't let him quit. "I was terrified," Harmander says. "He'd used running to pull himself out of the depression he fell into after his son died. What was he going to do without it?" Harmander convinced Fauja to run one more race. New York had been too difficult, he said. Three marathons in six-and-a-half months is remarkable for a 30-year-old. At 92 it's insane. "So give it some time," Harmander told Fauja. "Let your body recover, then see how you feel." Yet it would do no good. Guinness remained firm. "Passports may be used as proof of identification, NOT of birth.
" Guinness spokeswoman Jamie Panas wrote to ESPN The Magazine in an email. " Passports and other mid-to-late-life representations of age are notoriously unreliable when unaccompanied by original proofs of birth." Panas emphasized that Guinness never guaranteed that a passport would be sufficient. She also said that Sharma, the Guinness talent manager who advised Harmander, is no longer with the company. Sharma could not be reached for comment. His personal website says he left Guinness at some point last year. Fauja Singh wanted the world to watch him run. JULY, 2012. It's late on a Monday morning, one of those London summer days that barely feel like summer at all -- the sky dark, a cold drizzle just moments away. At Valentines Park in the outer borough of Redbridge, there are joggers and dog-walkers and morning strollers, all walking past ponds and trees and cricket grounds before returning to their nearby homes. 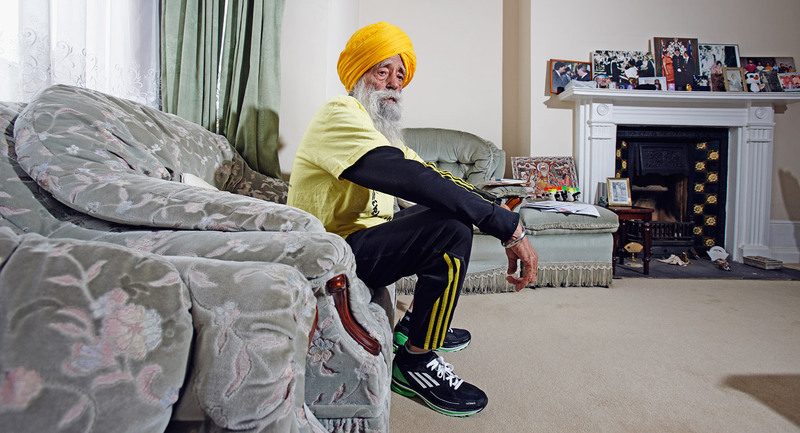 Up the path walks Fauja Singh, his yellow turban matching his yellow sneakers and accented by the yellow in his black adidas shirt. He is, Fauja will have you know, the oldest man to ever run a marathon. He doesn't care what Guinness says, barely knows who Guinness is. He and Harmander have taken to minimizing the slight. "They're in the business of trivia," Harmander says. "What does it matter if Fauja's name is in the same book as the lady with the longest fingernails in the world?" Fauja insists the book means nothing, but it's clear that recognition matters. "Look at this," he'll say, showing off his certificates and awards. Then he'll ask someone to read them aloud. He may be illiterate, but he understands the weight carried by words written down. He will retire soon. His last race will be a 10K in Hong Kong on Feb. 24, just before his 102nd birthday. This, he will admit, is difficult to accept. Yet he is tired; the racing and travel have taken their toll. He will still run, though. "The day I stop running," he says, "will be the day that I die." What began as a means of distraction from that stormy night in his village so long ago is now a joy unto itself, a path toward God. So each day he comes here, or he goes to other nearby parks or to a route that winds through town, and he ties his sneakers and begins to stretch. He rolls his head and his arms, then leans forward to touch his toes. In a moment he is off, the wrinkles in his face contorting into something between a grimace and a smile. There is no crowd, no finish line, no record at stake. There is only the shuffling sound of his feet, one moving in front of the other, then again, and then again and again until he rounds the bend and he's gone. Jordan Conn (@jordanconn) wrote "The Defender: Manute Bol's Journey from Sudan to the NBA and Back Again," a multimedia e-book published by The Atavist..
Join the conversation about "The Runner."